NEW YORK – April data indicated a positive month overall for the Canadian manufacturing sector, helped by the fastest rise in incoming new work since the start of the year. Export demand picked up markedly, with the latest rise in new orders from abroad the strongest since March 2011. However, there were signs that sales volumes had outstripped production capacity in April, which resulted in a further accumulation of backlogs of work. Supply chain disruptions also held back output growth, with the latest deterioration in supplier performance the most marked since the survey began in October 2010. The headline seasonally adjusted IHS Markit Canada Manufacturing Purchasing Managers’ Index (PMI) posted 55.5 in April, little-changed from 55.7 in March and well above the neutral 50.0 threshold. Although the lowest index reading so far in 2018, the latest PMI figure still signalled a strong overall improvement in manufacturing sector business conditions. The main drag on the headline index was the weakest rise in production volumes for five months, which survey respondents partly attributed to capacity constraints and supply chain disruption. “Supply chain pressures and high levels of capacity utilization were the main factors holding back manufacturing production growth in April. 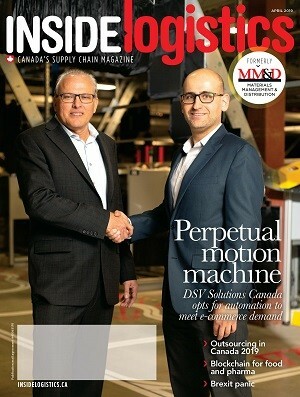 The latest downturn in supplier performance was the greatest reported for at least seven-and-a-half years,” said Christian Buhagiar, President and CEO, SCMA. Stretched operating capacity reflected a combination of strong client demand and longer delivery times from vendors in April. The latest rise in new orders was the fastest for three months, helped by an accelerated upturn in export demand. Anecdotal evidence suggested that an improving global economic backdrop had helped to lift new export order growth to its sharpest for almost seven years. Canadian manufacturers indicated that supplier lead-times lengthened to the greatest degree since the survey began in late-2010. Worsening vendor performance was attributed to a range of factors, including manufacturing capacity constraints (especially at steel mills), shipping delays for materials imported from Asia and ongoing issues with truck driver availability in the U.S.
Manufacturing companies reported a further robust increase in staff recruitment in April, linked to rising workloads and long-term efforts to boost operating capacity. Moreover, survey respondents indicated that business optimism regarding future growth prospects was the strongest for 12 months in April. Meanwhile, higher raw material prices, particularly for steel, placed upward pressure on input costs. The latest increase in overall cost burdens was the steepest since March 2014. Sharply rising operating expenses and resilient demand conditions led to the fastest increase in average prices charged by manufacturers for exactly seven years.